Happy thanksgiving to all my American readers! It's not something we celebrate here in Australia, but there are a few things I'd like to give thanks to - thanks to Toby for choosing not to sleep at night time anymore, it means we get to spend sooo much more time together! Their childhood is so fleeting why would you waste it on a silly thing like sleeping? Thanks also to Toby for passing on his annoying cough to me - it's a great way to work those abs without doing a single sit up. Thanks to Oscar for pulling through his near death experience last week on my birthday no less and is now practically back to normal. Thanks also to family for their wonderful birthday presents of a Japanese sewing book and some new camera lens, and especially to my husband for organising the kids to have a sleepover with their grandparents while we stayed in a fancy city hotel. And I'm thankful that I've finally finished my latest project: a simple tshirt that turned out to take a long time to finish. Well actually sewing it up didn't take that long, but sewing on the neckband four times until I got it right certainly did! I sewed mine from a mystery knit found deep within my stash, which is very soft and very stretchy. Like Sharon's version, my neckband was very droopy and too big which I also blame on the fabric, and I ended up taking in the neckband incrementally four times, until I ended up with it a smidgen too short (of course!) so there are a few puckers around the neck. Ah well, I can live with it because there was no way I was going to do it again! I quite like this top - it's as easy to wear as a standard tshirt but the gathered sleeves make it just that little bit different. It's really long though, you can see in that photo above that the hem of the tshirt sits halfway down my skirt that I've tucked it into. If I were to make this again I would definitely shorten it a fair bit because it's too long to wear out but too bulky to tuck in. Overall it's quite a good pattern, maybe I will make another one day when I've worked myself back up to working with knits. For now though it's back to sewing with well behaving woven fabrics, so much easier and more predictable! Australian Sewing Guild featured member - me! 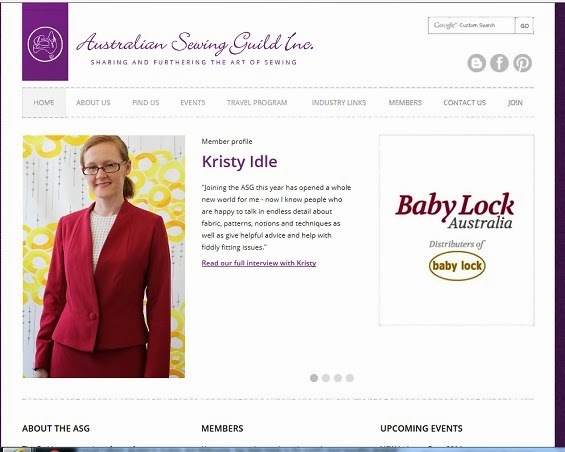 The Australian Sewing Guild has just launched its website with a much needed fresh new look and guess who just happens to be one of the first featured members? That's right - it is me! My husband thinks it's super hilarious, admittedly the photo is rather large and prominent on the website. Have a look for yourself here. I was one of the lucky ducks who got to spend Saturday sewing at the Tessuti Surry Hill's store for the day and I made a lot of progress on my white blazer. It was so inspiring not only sewing with lovely ladies like Sharon, Maria, BeaJay and other non-blogging sewing ladies, but also to be surrounded all day be beautiful fabrics and creative people shopping there all day was also encouraging. The lovely Colette is so genuinely lovely and friendly with all the customers, and it was a real pleasure to be there. It was also lovely to be recognised by a blog reader, who was equally excited to see Sharon and they got talking about some project or other. And the funniest thing was when a mother dragged her daughter over to us wearing her school formal dress asking for our opinion as to how to make it more modest - it was a one shoulder strap dress that she wanted to somehow add lace sleeves to it. Of course I couldn't escape without making a fabric purchase (or two!). I'm not restricting my fabric purchases although I am trying to sew from the stash as a first priority. But I already have plans for the two fabrics I purchased so they sort of don't really count as additions to the stash! On the left is a Michael Kors rayon (which doesn't seem to be in the online store) that I'll make some sort of dress for work from, and on the right is a viscose jersey (Boardwalk Jersey) that I am planning to make a simple t-shirt style dress. Hopefully I'll be back in a few days with a photo of my finished white blazer - I think that by putting it down here in writing I'll be forcing myself to come up with the goods! Oh and can I finish with a whinge (yes Renata I'm going to whinge about Burda!) - my November issue still hasn't turned up and it's now more than half way through the month. How can I keep to my Burda challenge when they are keeping me hanging on like this? Thanks everyone for your amazing comments on my skirt in the last post - it's funny how sometimes the simplest projects really hit the nail on the head! I've had such a slow sewing week, in fact it's taken me since last Sunday to finally finish this post and publish it. Toby has been quite unsettled this week and of course it's only mum that he wants when he's crying his little eyes out! It's nice to be wanted, but for crying out loud why did I have to get two children lousy at sleeping? I used Vogue 2783, a DKNY A-line dress that I've had in the pattern stash for a long time just waiting for the right fabric to come along. I tempted fate by using another cotton sateen fabric in the stash bought last year I think, but this one is a floral print instead of a solid and it seems to have a bit more stretch content than the green sateen I sewed with recently. Either way it doesn't seem to wrinkle as much which is good! I didn't leave myself time to make a muslin, which actually since I'm a bit lazy when it comes to muslins I probably wouldn't have made one anyway but I did check the reviews on Pattern Review. All of which said that the dress runs large and all the reviewers made at least a size smaller. After checking the flat pattern measurements I made a size 6 at the bust grading out to a size 8 at the waist and hips, even though according to their body measurements I needed a size 12/14/16 sized pattern. But this pattern still turned out absolutely huge! I ended up taking in another 5cm on each side down the side seams just to get it to fit across the bust and waist, and it's not skin tight. If I had more time I would have pulled it apart and distributed that evenly along all the seams but it seems to be ok just narrowing the side seam. I can't understand why Vogue would draft a princess seam dress, which needs to be fitted to have a nice shape, with 10cm of ease at the bustline and 15cm of ease at the waistline! I suppose you've noticed I left off the hem band too? Well it turns out this dress is really long as well as really big! I did a tissue pin fit and took out 6cm in length from the body of the dress but even that wasn't anywhere near enough because my finished dress has a 5cm hem even without sewing on that band. 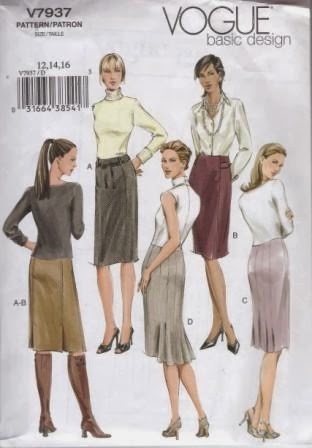 The pattern is described as mid knee length, and I know that I'm nowhere near model height, but this pattern as drafted would be more like mid calf length on me. Instead of hacking off a huge amount off the bottom of the dress to sew the band on I just chose to leave it off. 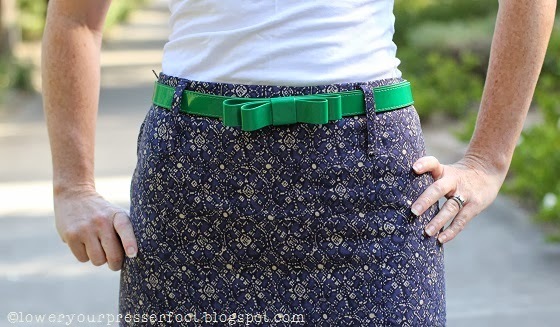 I also chose not to make the fabric belt as shown in the pattern because it doesn't look too flattering on those models - it's too loose and droopy I think. I think the dress looks fine without a belt though. As for the high tea it was delightful. Thanks to the lovely Velosewer for organising it in a chocolate shop, we all got to eat yummy food and a wide variety of teas finished up with a smash cake filled with delicious chocolates. It was great to meet a few new faces in real life and spend a few hours chit chatting about sewing. Of course I forgot to even get my camera out, but Maria has some great shots on her blog of all of us in our self made outfits. I seem to have a bit of a scatter gun approach to my sewing at the moment, which is never good for productivity and outcomes. At my last ASG sewing day I started making a muslin for another blazer, greatly helped with fitting and advice from the lovely ladies there that day. 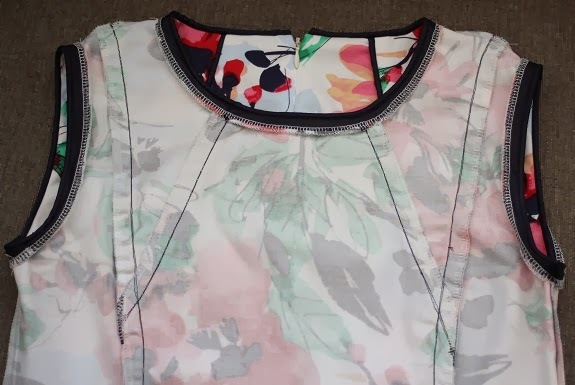 I cut out a dress to make specifically to wear to the PR high tea organised by Maria for this Saturday, but I couldn't start sewing it because I needed a zipper and a bajillion metres of piping. 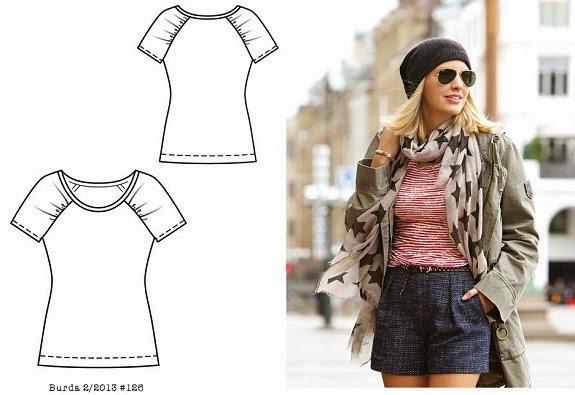 So then I traced out a Burda top (ironically both Sharon over at Petite and Sewing and Andrea over at Fabric Epiphanies have just made this top as well) but I couldn't sew that either because I ran out of white overlocking thread of all things! I used Vogue 7379 view B, which is one of their basic designs and I've had it for ages but is still available. It is very simple and almost fool proof in comparison to the similar Burda pattern I made recently in the red crepe that annoyed me so much. The pattern pieces are long and narrow because the front and back are in three pieces. Excuse those photobombing children in the background - they were a little excited about breaking up our usual morning routine of rushing about madly trying to get out the door on time and were running around like crazy. Who know what our neighbours and various people driving past were thinking! I did roll up the sleeves though for a slightly casual effect - I think this outfit would be a good casual Friday outfit (except that I don't work on Fridays so Wednesdays are the closest I get to a casual day!). Ironically it was really cold earlier this week so I ended up freezing going to work with bare legs and open toes, but I can see this skirt getting worn a lot this coming summer. Especially with the white blazer I'm planning to make if I can get it out of the muslin stage sometime soon!